Again I like what I see, and I get it really doesn't have a lot of torque, but for me it's all about the manual (although it seems the City of New York has only 4 and none of them have the optional LEDs and are already jacked up to 28k). Maybe lose that aggressive rear wing since it hasn't got the engine to back it up, but still like it as basic transportation with a clutch. Surprised they kept the old 1.8L as the base engine. Strange decision. 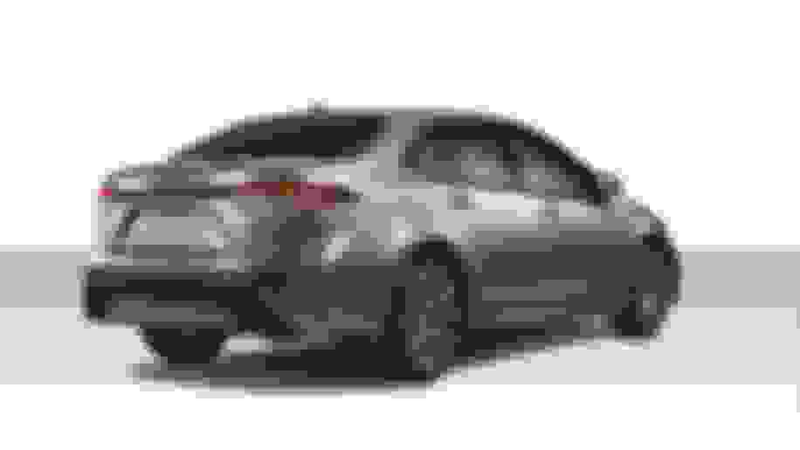 If I'm not mistaken, they also mentioned that they will be revealing a (first for US market) Corolla hybrid. 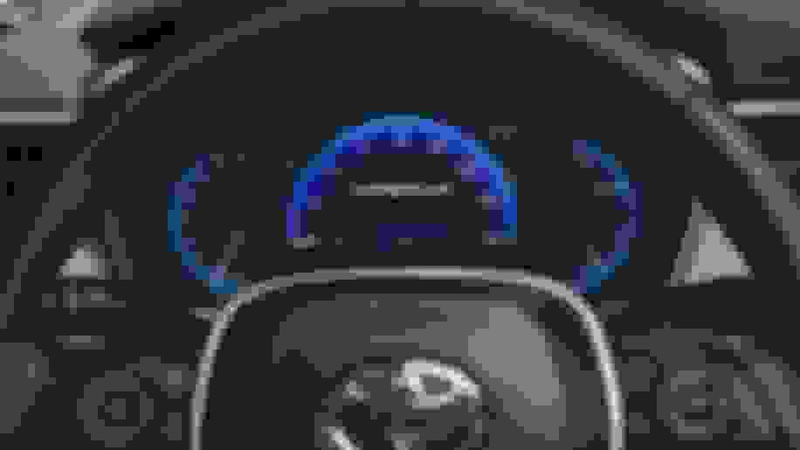 If the standard model gets ~40mpg combined, how much better would the hybrid be for it to justify the increase in price? From the pictures, the rear of the sedan looks like it took some cues from the Mirai. CARMEL-BY-THE-SEA, Calif. — Get ready to see a ton of the car you see here. 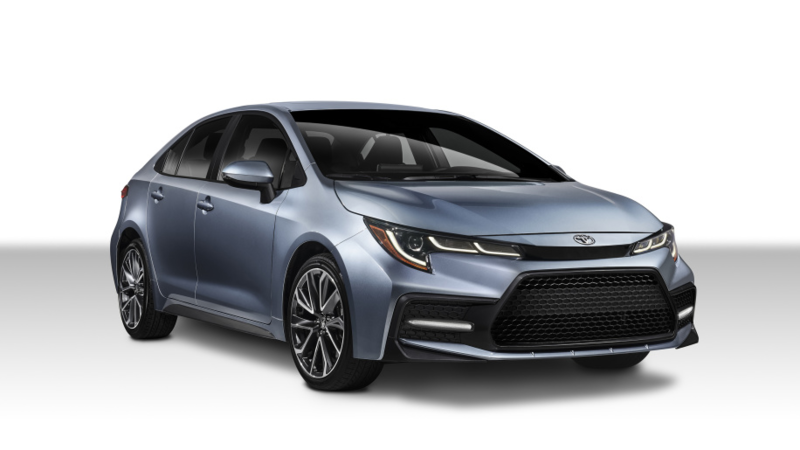 This is the completely redesigned 2020 Toyota Corolla sedan, the 12th generation of the bestselling car of all time, and one of the bestselling cars in the United States. It was unveiled tonight at the first-drive event for the also-all-new Toyota RAV4 (look for our first-drive review next week) ahead of its wider reveal two weeks from now at the Los Angeles Auto Show. 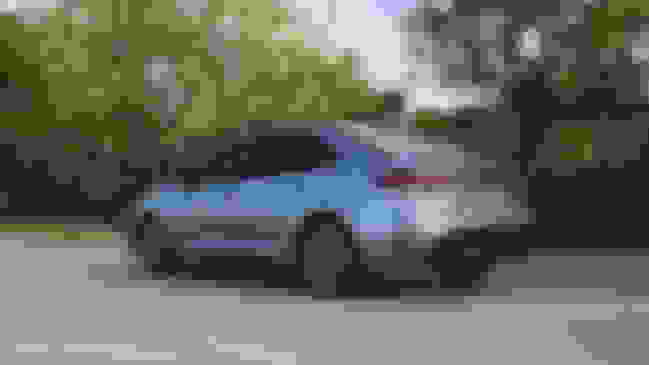 Not surprisingly, many of the details are common with the 2019 Toyota Corolla Hatchback introduced last year that impressed so much during our first drive and its subsequent stint at Autoblog HQ. 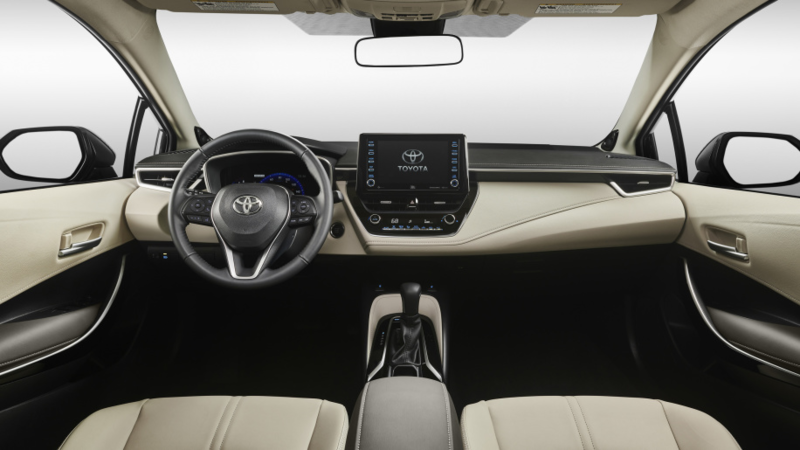 It shares the same TNGA platform (along with every other front-wheel-drive Toyota introduced since the most recent Prius), as well as its general interior design, many equipment updates and new 2.0-liter four-cylinder engine. Toyota also announced that there will be a Corolla Hybrid for the first time, but only said further details would be revealed when the vehicle officially debuts in LA. 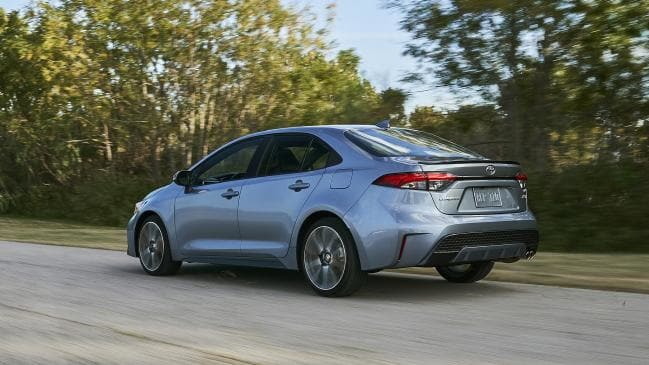 There are key differences, though, as there's more than just trunk design separating the 2020 Corolla sedan and its hatchback sibling. The Corolla has a 106.3-inch wheelbase, which is 2.4 inches longer than the hatchback. This should theoretically remedy a rather smallish back seat, though Toyota did not release full interior specs. However, considering the outgoing Corolla sedan had the same wheelbase and had one of the most generously sized back seats, we would expect space to be about the same. Space up front, or at least comfort, should be better. Like the hatchback, the driver seat is mounted nearly an inch lower and can travel 1.6 inches further back. Besides the space, it creates a more hunkered down, dare-we-say sportier driving position without (apparently) a reduction in visibility due to a comparably lower hood and dash. You sat on the Corolla before, but judging by these specs and the Corolla Hatchback, you'll sit in the new one. 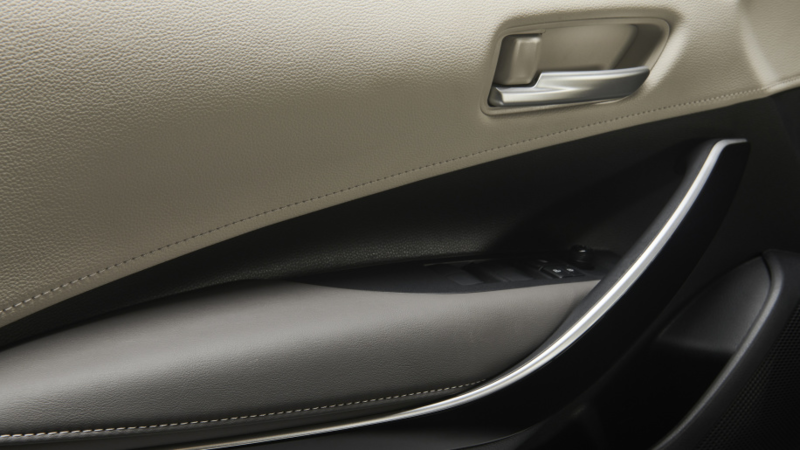 The seats you sit in, however, will depend on trim level. The sportier SE and XSE trim levels feature more aggressively bolstered sport seats versus those in the LE and XLE. These are just some of the myriad changes between the SE and LE grades. Others include design differences (the images you see above that Toyota released are of an XSE) with the sportier trims getting an extra LED "J" lighting element around the standard bi-LED headlamps, along with smoked taillights, a body-colored chin spoiler and aero stabilizing fins up front. The design itself also differs considerably from the hatchback, and from first glance, we can't say for the better. The lower grille is bigger and more Avalon-like, while the larger taillight units and trunk-mounted license plate eliminate the hatch's pert, athletic appearance. Only the headlight units seem common between the two cars. There are commonalities under the hood, but it depends on the trim level. The SE and XSE share the Hatchback's new 2.0-liter four-cylinder engine (169 horsepower, 151 pound-feet of torque), but the L, LE and XLE get a revised version of the outgoing car's 1.8-liter four-cylinder that delivered some of the slowest acceleration times in the segment. Revised specs were not provided, only a promise that it offered "more horsepower and better fuel efficiency." We can't imagine either will be significantly enhanced. If there was ever an indication that the SE's are for those who like to drive, and the L's are for those who don't, this is it. All, however, get the same transmission choices that so impressed during the Corolla Hatchback first drive: a six-speed manual transmission with rev-match downshifting, or a continuously variable transmission with a literal first gear that improves fuel efficiency and drivability. Fuel economy estimates have not been announced. All trims also feature the same basic suspension, which is new for 2019. 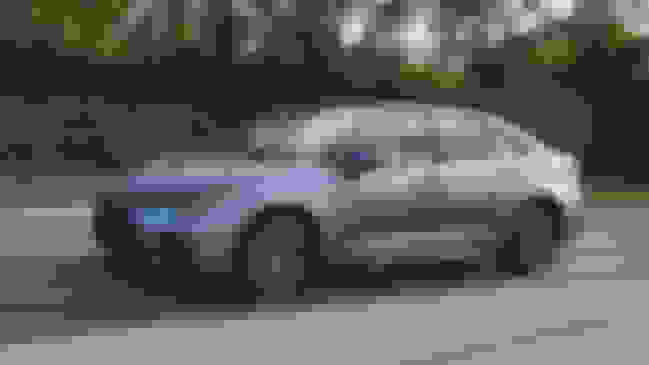 There are MacPherson struts up front, while the old car's torsion beam has been tossed in favor of a multi-link rear presumably shared (or at least similar) to the one in the Corolla hatchback. 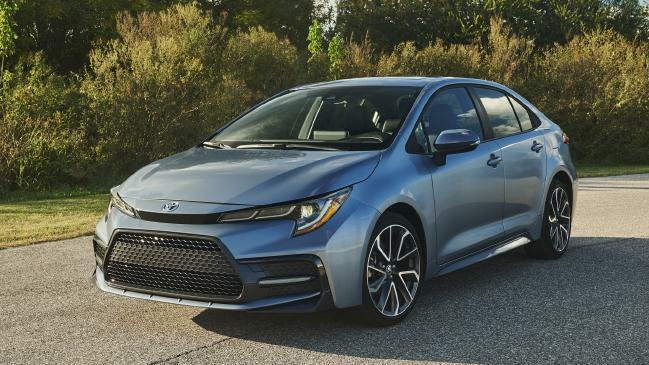 This, in combination with a stiffer structure, steering improvements and a general shift in tuning philosophy, should result in a much better, more engaging Toyota Corolla. That's not a backhanded complement, either, as virtually every Toyota we've recently driven has demonstrated genuine handling precision and driver involvement. In terms of equipment, the sedan is offered in L, LE, XLE, SE and XSE trim levels (the hatchback offers only the SE and XSE). 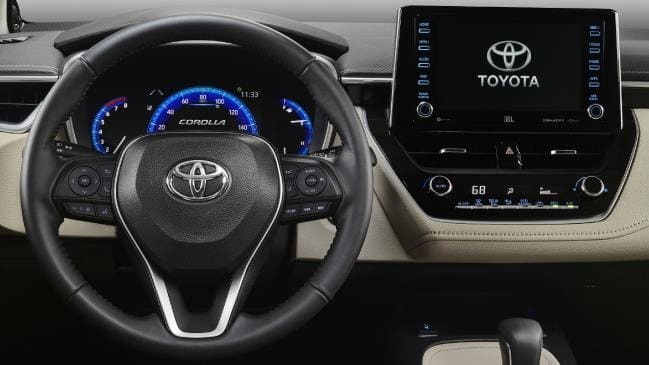 Toyota Safety Sense accident avoidance tech is standard on every trim level, as is Apple CarPlay and Amazon Alexa connectivity, Wi-Fi, a six-speaker sound system and a touchscreen that's upgraded to 8 inches on all trims but the base Corolla L (they also get an extra USB port). Given its high-mounted location, that screen actually looks much bigger than that when behind the wheel. The interior itself, much like the identically designed one in the hatchback, looks much better than the outgoing car's and features improved materials throughout. Toyota didn't announce an on-sale date, but given the model year, some time in the middle of 2019 is the safe bet. If you're wondering if you should wait for this new Corolla rather than stick with the current one, there are so many compelling improvements that the easy answer is "yes." However, if our word isn't good enough, the Corolla Hatchback currently sitting on dealer lots is similar enough to provide a sufficient analog for what's to come. 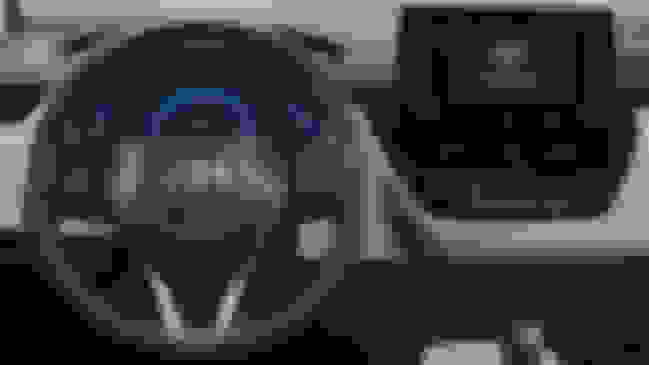 Last edited by Hoovey2411; 11-16-18 at 10:34 AM. The engine in the L, LE and XLE grades is the 1.8 litre 2ZR-FAE (with Valvematic), the optional engine in the current-generation Corolla sedan. The engine in the sportier SE and XSE grades is the same 2.0-litre M20A-FKS Dynamic Force engine used in the new Corolla Hatchback. I am looking forward to this model. I always thought that the youngest sibling was the wild-and-crazy one and the older siblings were the more proper, quiet and upright ones, yet the big brother Avalon has the wild-and-crazy look-at-me clothes, the otherwise shy middle-child Camry sports trendy looks and the little brother Corolla is the quiet, introverted one. I do not believe the eCVT (Power Split Device) has the direct-drive first gear that the new CVT has. Agreed. A TRD Avalon just seems weird. Speculation is already happening that a TRD Corolla could follow suit. I would't expect it before the hybrid though. I understand what you are saying. The article, though, I believe, said nothing about the not-yet-introduced Corolla Hybrid, not to mention that these writers usually have absolutely no idea what they are talking about when it comes to hybrid vehicles. While it would certainly be amusing to have a separate 1st gear in a hybrid CVT, I agree with Sulu that it isn't apparent that the new Corolla Hybrid does. Nor would it make a lot of sense considering.